We left Taos and headed southeast to Amarillo, TX. It would be a little too far to make it comfortably in one day, so we stopped overnight in Tucumcari, NM, at Cactus RV Park. Cactus RV is located on historic Route 66 close enough to I-40 to be convenient, but far enough away that there is no way you could hear the traffic. Cactus RV is on the grounds of an old motel, and the old motel rooms still run down the eastern side and across the back of the campground. It feels a little bit like a piece of history. The campground has full hookups (no restrooms or showers, so self-contained RVs only), free Wi-Fi, and cable TV. There are a few bigger shade trees, but mostly there are smaller trees (primarily junipers) between the sites for privacy. All sites are level and most are extra long pull-throughs so you don't have to unhook if you don't want to. 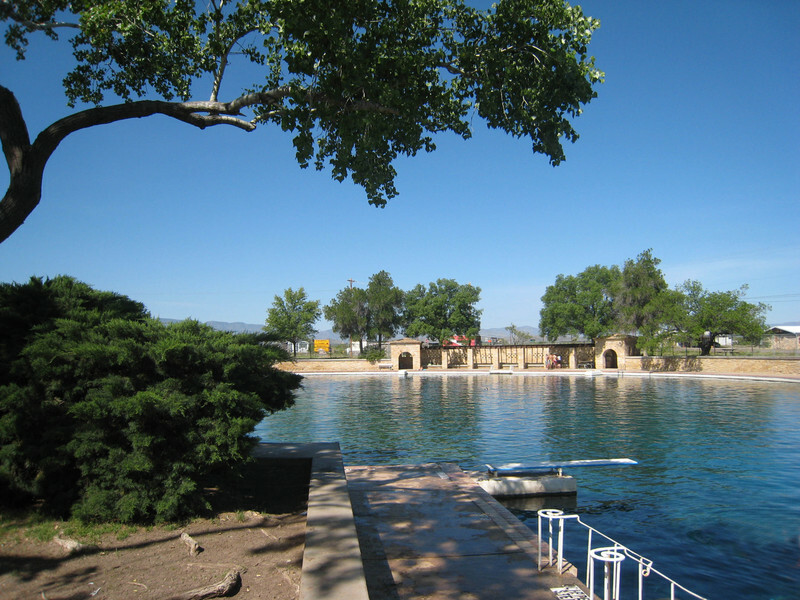 Cactus RV is great for a one- or two-night stop, especially at the Passport America rate of $13 a night plus tax. The sites at the front of the campground are all gravel and there are some in back that don't seem to get much use that are in an open, grassy field. The photo below shows our site at Cactus RV. From Tucumcari, it was about a two-hour drive to Amarillo, although we lost an hour to the time change going from Mountain to Central time. We arrived at Ft. Amarillo RV Resort in the early afternoon. It was Sunday and the office was closed, but they had a little packet of information for us with our name and site number on it at the night registration desk. Ft. Amarillo RV is located west of the city just off I-40. In fact, I-40 overlooks the campground and there is some traffic noise from the interstate. The roads and sites are gravel (it looks like some parts may have been paved at one time). They could use a little fresh gravel to reduce muddy spots when it rained and to cut down on dust when it was dry. The sites are mostly pull-throughs. The campground has full hookups, free cable and Wi-Fi, an indoor pool, a hot tub, an exercise room (with two weight machines, a set of dumbbells, two treadmills, and a stationary bike), a putting green and a tennis court. Each site has a small, concrete patio. The spacing of the sites isn't too bad for a private campground, and they also have 3 foot high privacy fences between sites. The photo below shows our site at Ft. Amarillo RV. Last year we spent a good bit of time farther south in Texas, and we were curious about the northern panhandle. Since our route back east this year took us through the panhandle, we scheduled a week stopover to explore Amarillo. This got us a weekly rate at Ft. Amarillo RV Resort that averaged out to a little less than $21 a night. We had previously researched Amarillo on the internet and found some sightseeing possibilities, but we also needed a stop near a little bigger city like Amarillo because Margery needed to do a little shopping and because Paul needed to find a Lowe's or Home Depot for a few supplies for some minor RV repairs. Approaching Amarillo, we ran into something we haven't seen for a while - rain. 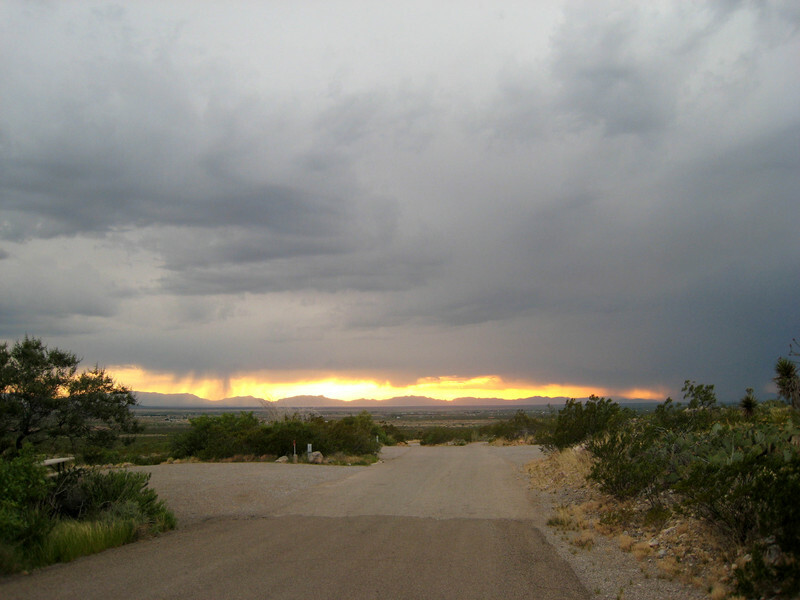 Oh, we've seen a few thunder showers, especially in Taos; but we haven't seen several days of off and on rain. Well, a rainy day was a good time to get our shopping done. Then on the second day of 80% chance of rain, we started out with a breakfast buffet at the Big Texan Steak Ranch. The Big Texan is famous for its 72 oz. steak dinner that's free if you can eat everything, including the shrimp cocktail, salad, baked potato, roll, AND the 72 oz. steak, in an hour or less. If you decide to try it, you get to sit on the stage so everyone can watch. About 8,000 people have successfully completed the feat since the restaurant opened in the '60s. If you don't make the one hour time limit, the meal will set you back $72. The photo below shows the outside of the Big Texan. Even on the overcast, rainy day we were there, the bright yellow color almost hurt our eyes. They offer free limo service to and from nearby motels and campgrounds. The limos with the cattle horns on the hood are parked to the right. That's Paul posing in the photo below, and that's about as close as he's going to get to a 72 oz. steak. Maybe the Big Texan's steaks are better, but the breakfast buffet was mediocre at best. Even though they had made-to-order omelets and pancakes, we thought the buffet selection was rather limited and the food was pretty dried out. At a cost of $8.95, we were very disappointed; and we think the Der Dutchman breakfast buffets in Waynesville and Walnut Creek, OH, are much better and a couple of dollars cheaper. After breakfast, went to the Panhandle-Plains Historical Museum about 15 miles south of Amarillo in Canyon, TX. 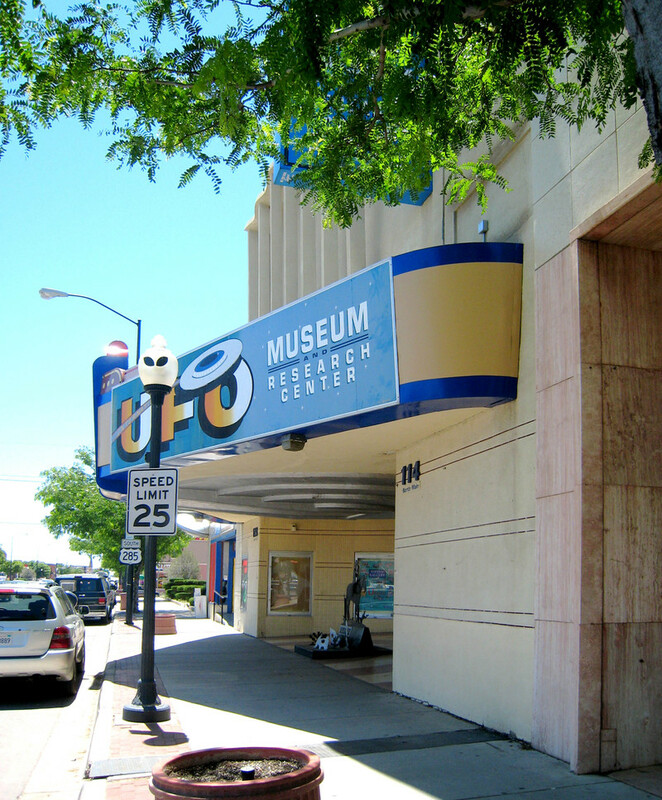 The Texas Panhandle lies in the southern Great Plains, and the museum covers the history of the area from fossils of prehistoric animals, through the archeology and history the Plains Indians, all the way to modern times. There are also collections of American art, Native American art, and firearms. In the photo below, Margery is checking out a model of an Indian pueblo. Water has always been important to the plains. 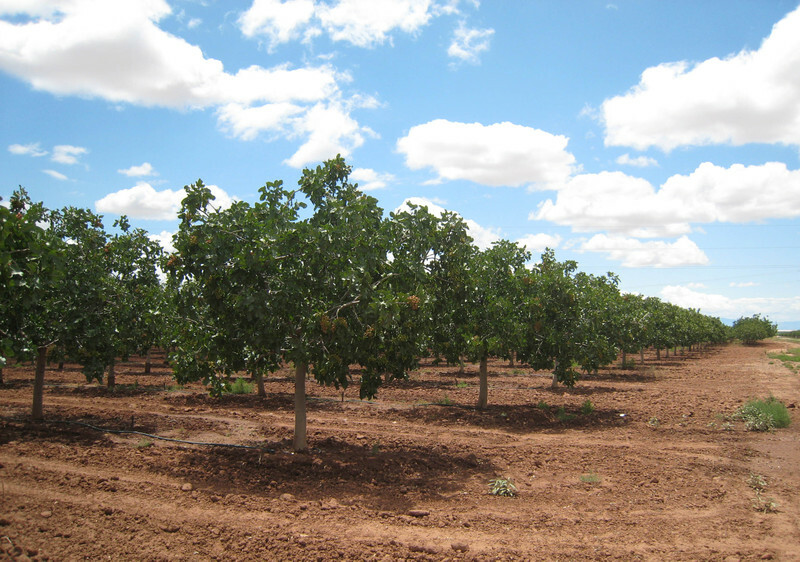 The Ogallala Aquifer underlies about 225,000 square miles of the Great Plains, including much of the Texas Panhandle. The museum has a collection of windmills, which were (and still are) used to pump water from this underground aquifer. The museum has a lot of information on the history of oil in the Texas Panhandle. Oil was discovered in 1925 and the boom of oil discovery continued into the 1930s. The photo below shows a pump jack from that period. As we left the museum, the rain had stopped, at least temporarily. We hit a few light showers on the way back to the motor home; but by late afternoon, it looked like the rain was pretty much over. 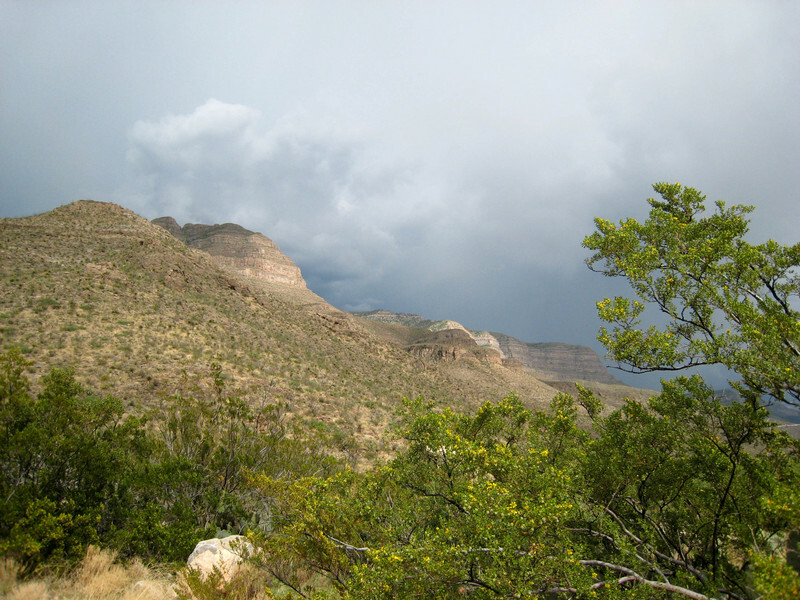 We gave the weather an extra day to clear, then headed back down toward Canyon, TX to visit Paol Duro Canyon State Park. The name Palo Duro translated from the Spanish means "hard wood" and came from the mesquite and juniper trees found in the canyon. 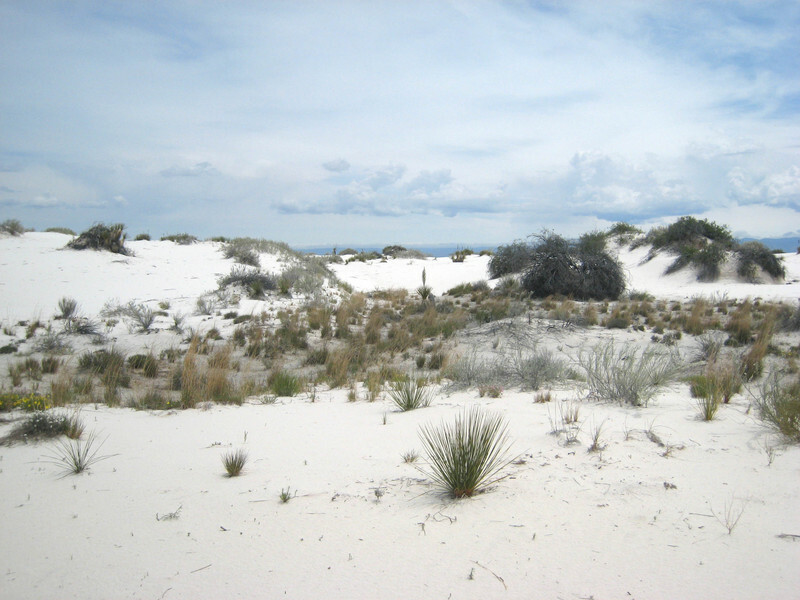 The canyon was cut into the soft, sedimentary layers of the Texas Panhandle by the Prairie Dog Town Fork of the Red River. Although the river isn't very big, we saw evidence of its power. The road through the park crosses the river several times and there was dried mud all over the roads at the crossings indicating the river had overflowed its banks during the recent rains. One branch of the road was still closed due to high water even though it had been two days since the rain had ended. The water in the river was red with mud indicating the river was still at work to deepening the canyon. Palo Duro Canyon, which is called the Grand Canyon of Texas, is about 120 miles long, up to 20 miles wide, and a maximum of about 800 feet deep. The state park, which was opened in 1934, comprises 26,275 acres in the northernmost part of the canyon. The Civilian Conservation Corps (CCC) built most of the roads and buildings in the state park. 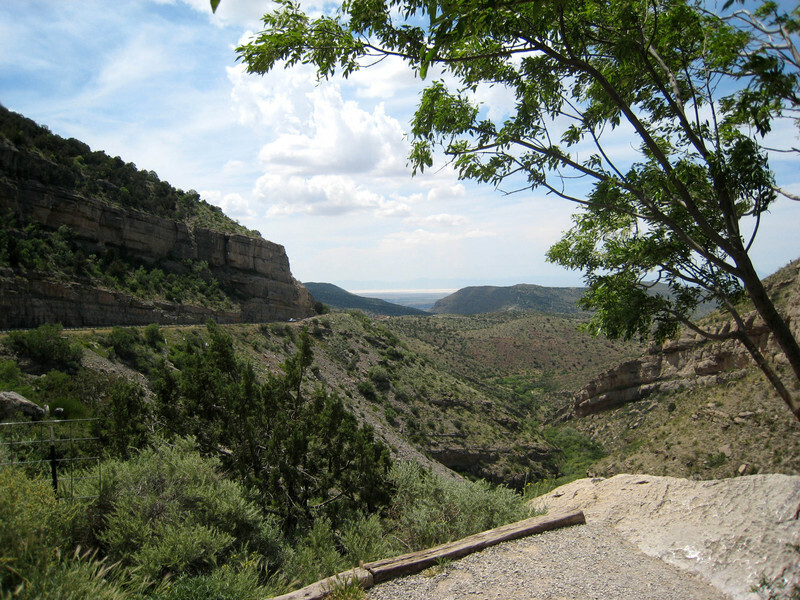 The photo below is looking down the canyon from the visitor center. 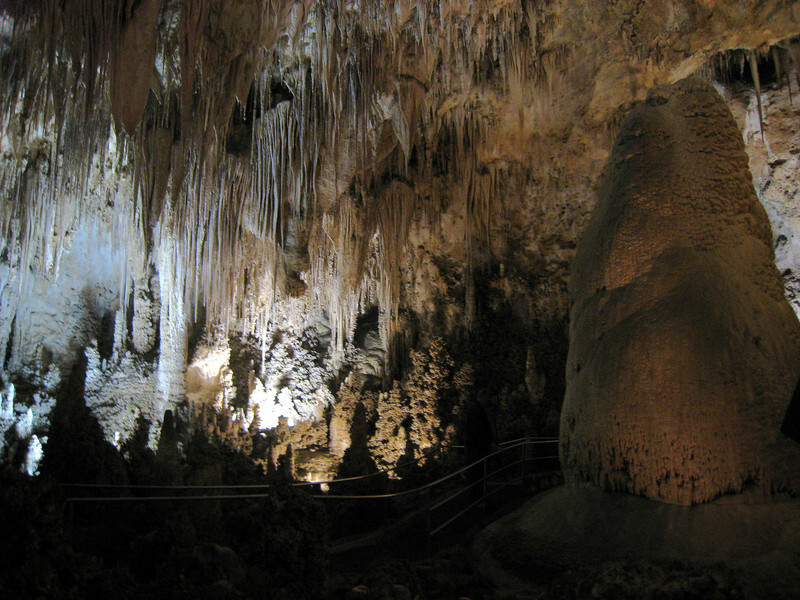 In the closer view below, the flared formation to the lower right of center is called Spanish Skirt. The Lighthouse is a famous formation in Palo Duro Canyon. The hike to the Lighthouse was 5.75 miles round trip with a vertical climb of over 800 feet. With the difficulty making the 3 mile hike with a 480 foot climb to Delicate Arch in Arches National Park recently, we decided to pass on the hike to the Lighthouse. We had to settle for a telephoto shot of the Lighthouse from about 3 miles away. The Lighthouse is just to the left of center in the photo below. The visitor center had a very good video about the history of the canyon. The first inhabitants thousands of years ago were nomads who hunted mammoth and bison in the canyon. A Spanish expedition came to the area by way of Taos in 1541. The Apache were living in the canyon at the time, but they were soon displaced by the Kiowa and Comanche. In 1874, the Native Americans were removed to reservations in Oklahoma. In 1876, Charles Goodnight came to the canyon and started JA Ranch. The ranch, which still operates on a smaller scale today, had as many as 100,000 head of cattle at one time. Beyond the visitor center, the road descended down into the canyon. As is did, we could see the brightly-colored layers of orange, yellow, red, and mauve in the canyon walls. Down on the canyon floor, we stopped at a reproduction of the dugout shelter used by Charles Goodnight until he could build a proper house. It was pretty grim - dark, dank, and musty-smelling. We could only imagine what it must have been like mixed with animal smells, dust, and wood smoke. But the location was beautiful. These rock layers were near the dugout. And the formation shown below called Fortress Cliff was not too far away. We passed the fellow in the photo below on the road and turned around to take another look. By the time we got back, he was off in the weeds, so this was the best photo Paul could get. He wasn't about to chase a 4+ foot diamondback rattlesnake into the tall grass. The canyon is also the home of Texas, an outdoor musical drama featuring fireworks, special lighting, and a cast of 60 actors, singers, and dancers. Unfortunately, the last show of the season was the day we arrived in Amarillo, so we missed it. After we left Palo Duro Canyon, we stopped at a roadside pull-off about a mile west of the campground called Cadillac Ranch. Cadillac Ranch is located in a field just off the frontage road that parallels east bound I-40. Cadillac Ranch was built in 1974 and was the brainchild of an art group called the Ant Farm and consists of 10 Cadillacs ranging from 1949 to 1963 models. The model years represent the "tail fin" Cadillacs. The graffiti-covered cars are buried nose first at an the same angle as the sides of the Great Pyramid of Giza in Egypt. In 1997, the installation was quietly moved two miles west to be farther from the growing city. The public is encouraged to visit the site and to express themselves with spray paint. The vehicles are occasionally repainted various colors to commemorate special occasions or to simply provide the public with a fresh canvas. Are they junk cars or art? We'll leave that for you to decide. As we like to do, we again left ourselves a day at the end of our stay to catch up on chores. We cleaned the inside of the motor home, Margery did several loads of wash, and Paul washed the car and finished washing the outside of the motor home.) On the day before we move on, we also like to do things like check the tire pressures and stow gear to prepare for departure, and to have a little time to relax. We are continuing our eastward migration. On April 1 we left Mission, TX, and headed north to San Antonio home of the River Walk and the Alamo. We stayed at Guadalupe River State Park just north of San Antonio. 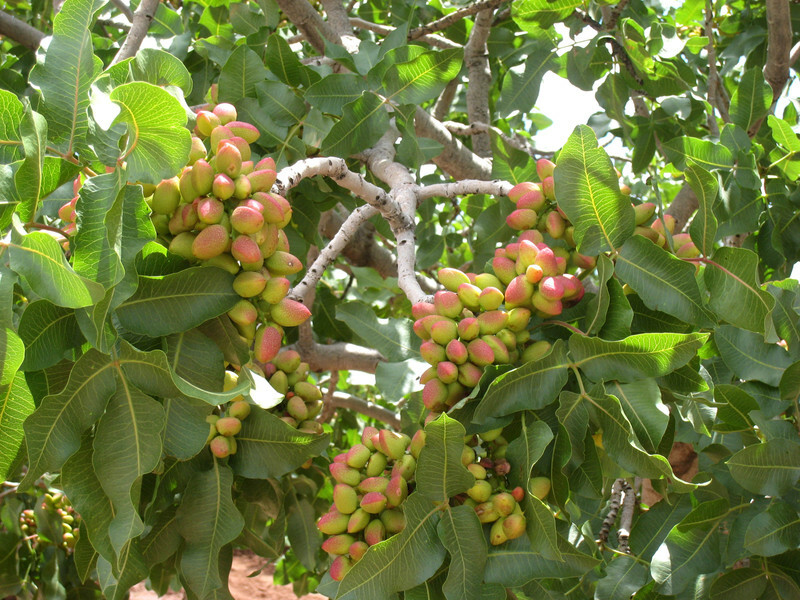 The sites in the park are well spaced with trees and shrubs between. Although we very much liked Bentsen Palm Village where we stayed in Mission, the more natural setting of a state park was an enjoyable change after having been at an RV "resort" for a month. Having seen the Alamo Village movie set in Brackettville, TX, about two months ago, we were anxious to see the real Alamo. 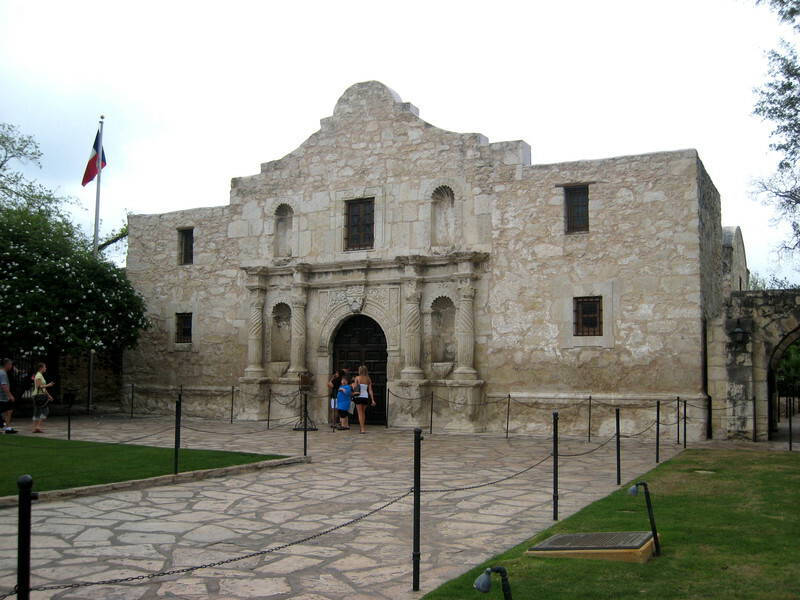 Construction of the Alamo, which was originally called Misión San Antonio de Valero, was begun in 1724. The mission was closed in 1793 and in the early 1800's the Spanish stationed a cavalry unit at the former mission. The soldiers called the mission the Alamo (Spanish for cottonwood) in honor of their former home. Texas was originally claimed by Spain and was later part of Mexico following the Mexican Revolution. Many Americans settled in Texas and became Mexican citizens. In 1835 internal strife in the Mexican government led to General Antonio Lopez de Santa Anna abolishing the constitution and declaring himself dictator. These acts eventually led to the famous battle in 1836 where roughly 200 heroic Texans perished defending the Alamo holding out for 13 days against the overwhelming numbers of Santa Anna's army. Among the men commanded by Col. William Travis were Jim Bowie, famed knife fighter, and David (he didn't like to be called Davy) Crockett, frontiersman and former U. S. congressman from Tennessee. Less than two months later on April 26, 1836, Santa Anna was defeated by Texan forces commanded by Sam Houston in a battle that lasted 18 minutes. Santa Anna himself was captured enabling the Texans to extract a treaty granting them their independence. Whereas Alamo Village depicts the Alamo as it was in 1836 without a roof and with earthen ramps inside, the real Alamo has been largely restored. The only other original building that survives is the barracks, which now serves as a museum. 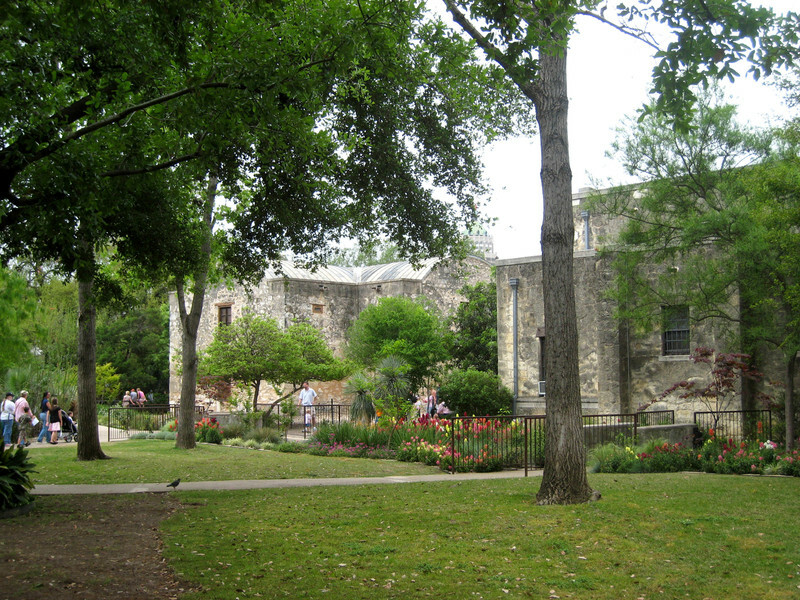 The Alamo stands on a 4.2 acre plot in downtown San Antonio and is surrounded by serene gardens and live oak trees. Near the Alamo is one of many entrances to the River Walk or Paseo del Rio. 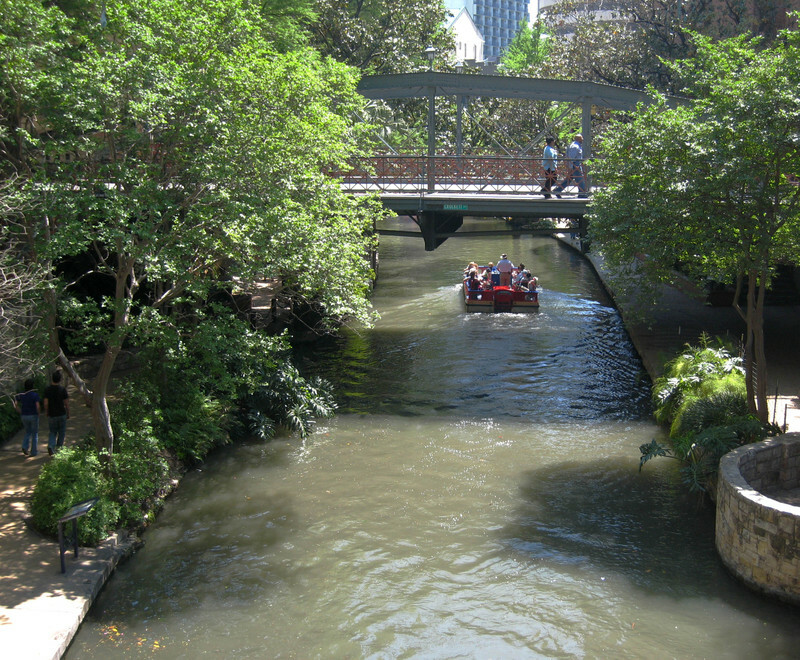 The San Antonio River makes a loop through the downtown area and lies one level down from street level. The River Walk can be accessed by means of steps from most of the many overhead bridges and through several buildings that front the River Walk. There has been development along the river throughout most of the history of San Antonio, but a comprehensive flood control plan created a bypass channel with flood gates and flood pools in the 1930's and made possible the River Walk as it exists today. Major planning and renovation of today's River Walk took place in the 1960's. Plans for improvements and expansion are ongoing. 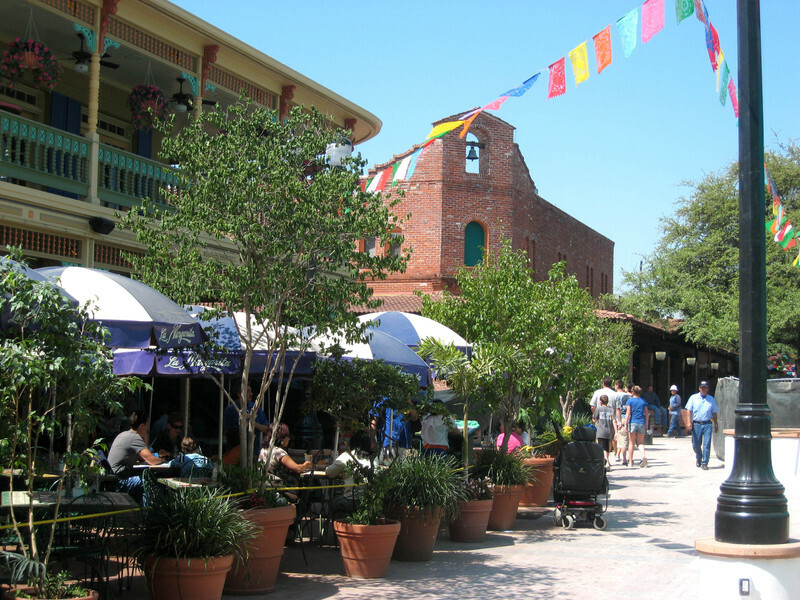 The River Walk is a quaint, picturesque area of shops and restaurants along the San Antonio River. 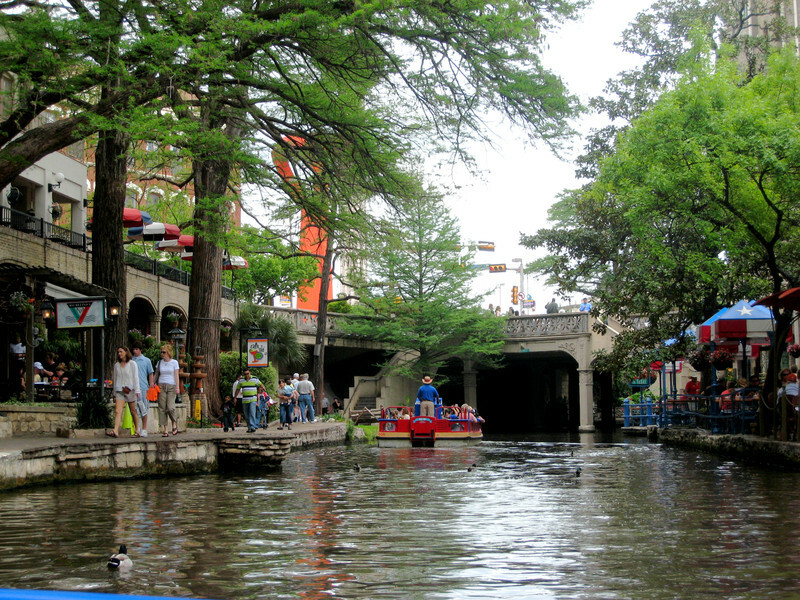 There are 35-minute narrated tours of the River Walk aboard small, colorful boats. The buildings have been built or renovated in the early Texas or colonial Mexican style. Walkways wind along the river and are lined by beautiful landscaping and shaded by overhanging trees. Many of the restaurants have tables with colorful umbrellas right along the water where you can sit, eat, and watch families of ducks scurry out of the way of the tour boats. Down along the river it's easy to forget about the hustle and bustle of the city above. See Photo Album 016: San Antonio and the Hill Country the for more pictures of River Walk. At the western end of San Antonio is the Market Square or El Mercado. 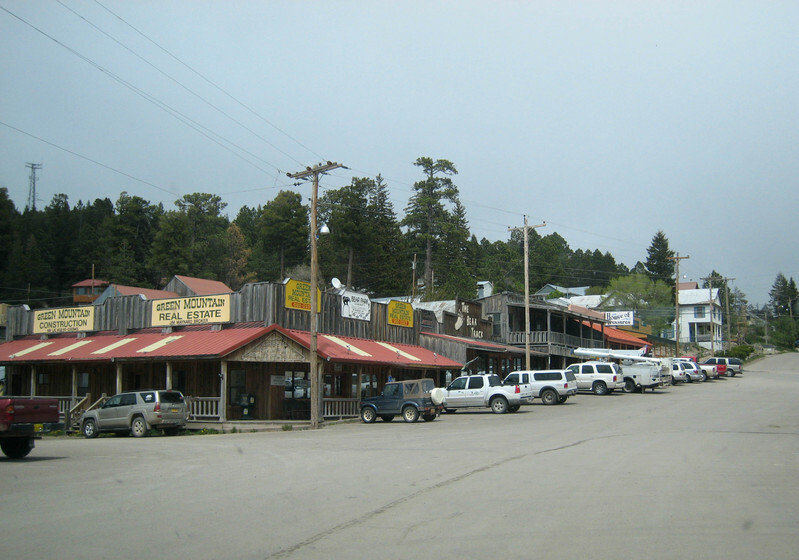 To the north of San Antonio are several German settlements dating back to the 1800's. Gruene, (pronounced Green) which is one of these towns, was just about 30 miles west of where we were staying. 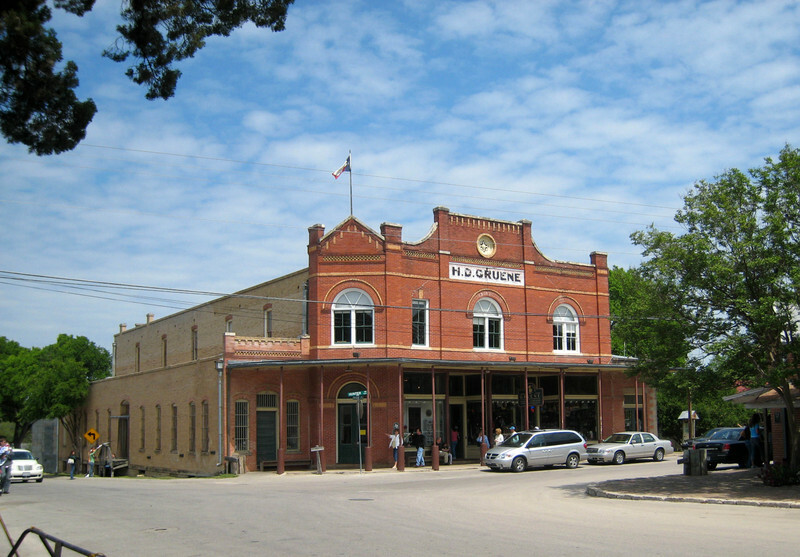 It was founded by Henry D. Gruene in 1872 when he established a grist mill on the banks of the nearby Guadalupe River. This general store was one of many of his later businesses. 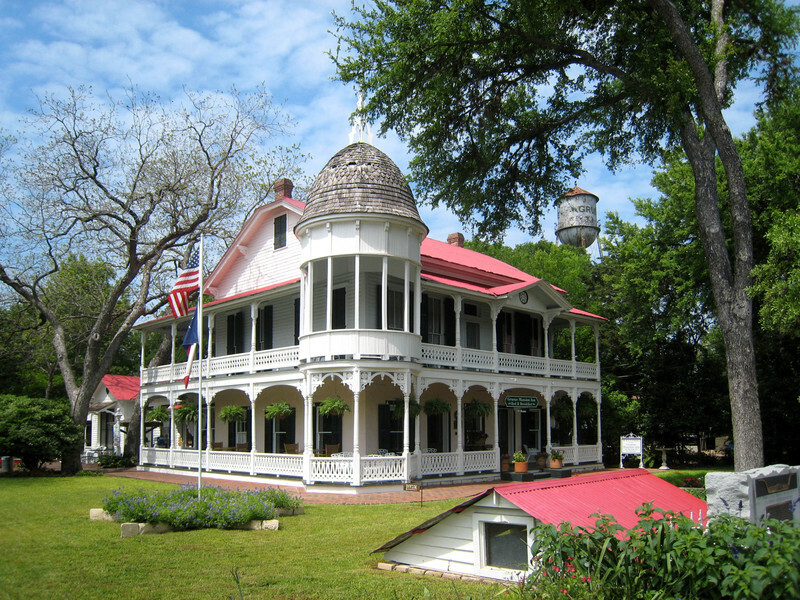 Gruene is a small town that is full of quaint shops, restaurants, and bed and breakfasts. This is is the Gruene Mansion Bed and Breakfast. After a week in the San Antonio area, we left for Fredericksburg which is deeper in Texas Hill Country. 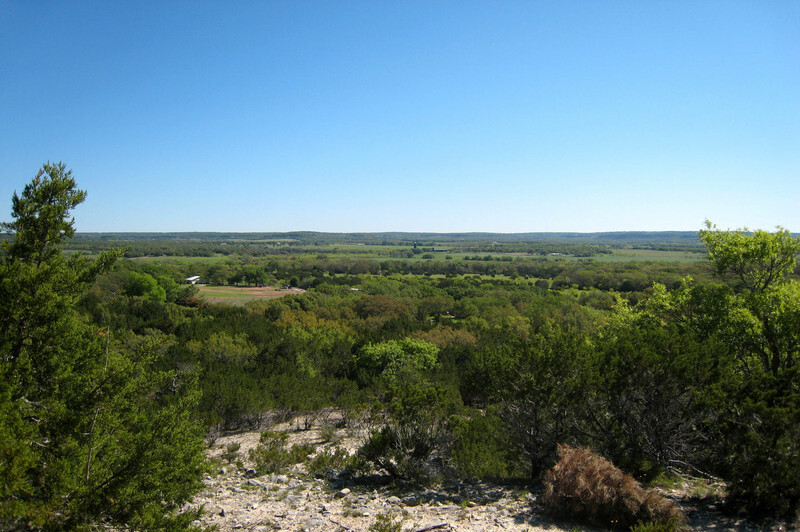 Hill Country is an area of rolling, sometimes somewhat rugged, limestone hillls in central Texas that runs from San Antonio roughly 75 miles northward and from Austin roughly 100 miles westward. Hill Country attracts millions of tourists each year and is dotted with quaint towns, wineries, bed and breakfasts, shops, and art galleries. The area is very picturesque, even when the wildflowers are not in bloom, but we were thrilled to arrive at the peak of bluebonnet season. One of the things we liked about the terrain was that although the hills could be covered with trees, generally the trees were only 15-20 ft. high which meant when getting to a rise in the road, you could see over the top of the trees into the valley and on to the next hill. Fredericksburg is another of the German settlements in this area of Texas. The town was named for Prince Frederick of Prussia. After being so close to the Rio Grande River and the Mexican border for the past few months, it was strange to see the German influence. We were used to seeing the names on streets, mailboxes, businesses, etc. in Spanish, and we were now seeing them in German. 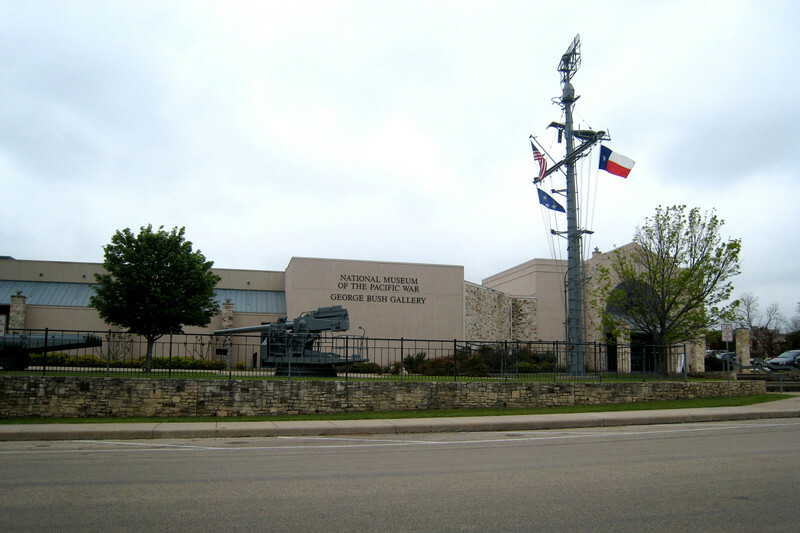 Fredericksburg is the home of the National Museum of the Pacific War. Admiral Chester W. Nimitz, who was the Commander-in-Chief of the Pacific during WWII, was born in here so Fredericksburg is a fitting home for the museum. Neither of us ever had the chance to study WWII when we were in school, so we really appreciated the opportunity to learn more. The Museum follows the entire history of the war in the Pacific from early Japanese aggression against the Chinese through the attack on Pearl Harbor to the dropping of atomic bombs and the Japanese surrender. Throughout the progression of the displays about the war in the Pacific, there was information about what was going on in Europe and the rest of the world. There are many interesting exhibits from a real B-25 bomber to photos, diaries, artifacts, and mementos. The Museum of the Pacific War includes the Japanese Peace Garden. The garden was a gift from the Japanese people to the American people to promote good will after the war. In addition to learning about WWII and driving the back roads looking at wildflowers, we also visited Enchanted Rock. 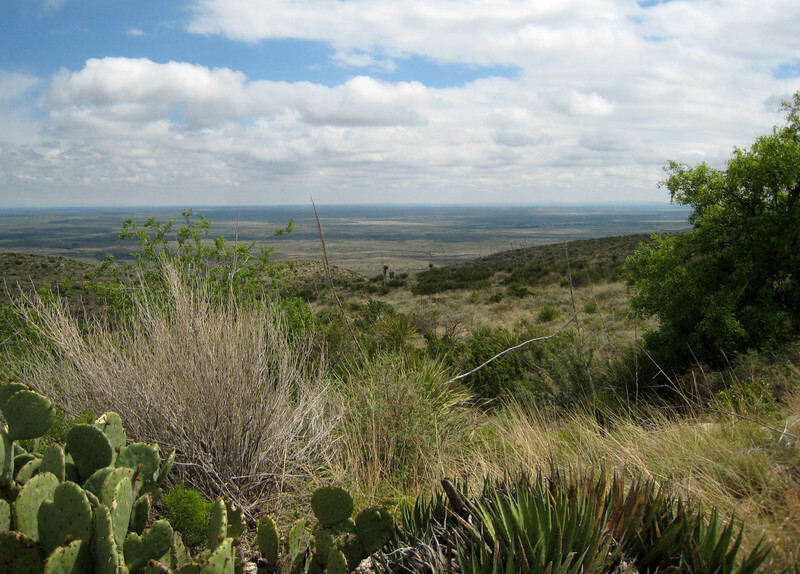 Below is the view approaching Enchanted Rock from the south. Enchanted Rock is the large dome just to the right of center. Little Rock is to the left. 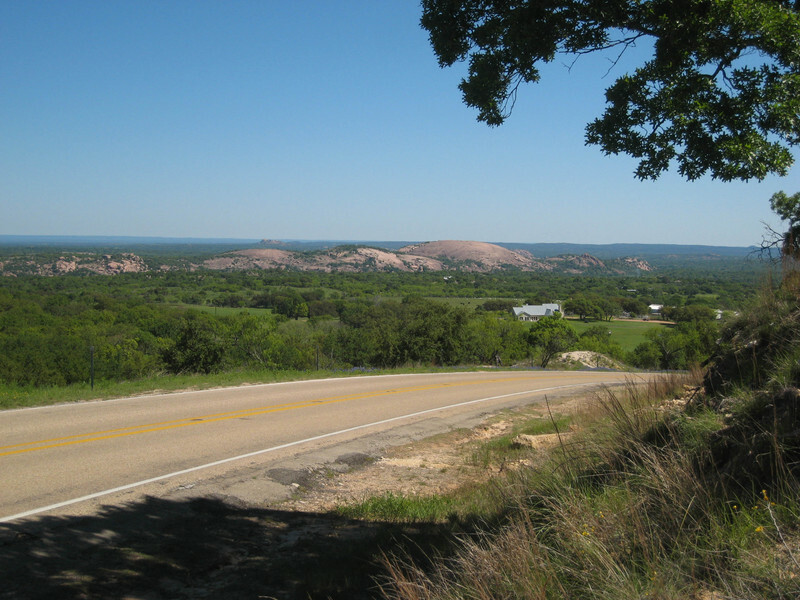 Enchanted Rock is a pink granite dome that rises 425 feet above ground level. It is a steep 20 to 30-minute walk to the top. See Photo Album 016: San Antonio and the Hill Country the for more pictures of Enchanted Rock, including views from the top. After spending about two weeks of almost daily sightseeing in the San Antonio and the Fredericksburg areas, we needed a little time to catch up on grocery shopping, laundry, and relaxation. So we moved about 20 miles down the road to the Kerrville-Schreiner Park to get outside the bustle of the main tourist areas. A former Texas state park, Kerrville-Schreiner Park is now operated by the city of Kerrville. It has sites along the Guadalupe River on one side of the road, but we opted for the quieter sites with reportedly more wildlife on the other side of the road. We weren't disappointed. 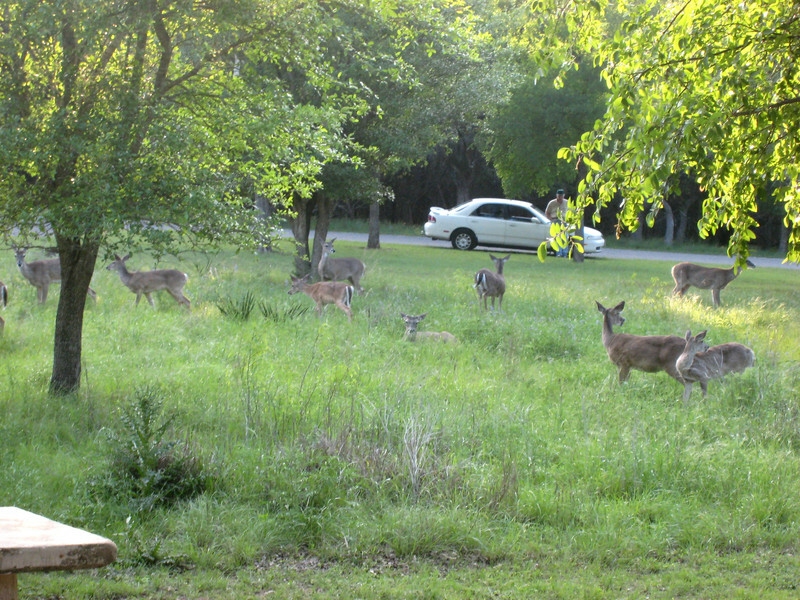 Deer came through in the mornings and evenings and frequently stopped to graze. Some of them came quite close to the campers, but Molly seemed to make them a little nervous so they stayed about 20 feet away from us. Although we traveled through major produce-growing areas most of the winter and had little trouble getting vegetables, one of our favorite things that is hard to find in the southwest is fresh basil. We had been thinking about trying to grow our own and now that it was spring and we were in an area with numerous nurseries, we picked up a basil plant and also a cilantro plant. Although fresh cilantro is plentiful in the grocery stores here, we never seem to have it when we want it; and, unlike many other herbs, cilantro is one herb that there is just no substitute for fresh. Paul stopped at Lowe's and picked up some small pieces of lumber and some paint to build a caddy for the potted herb plants. 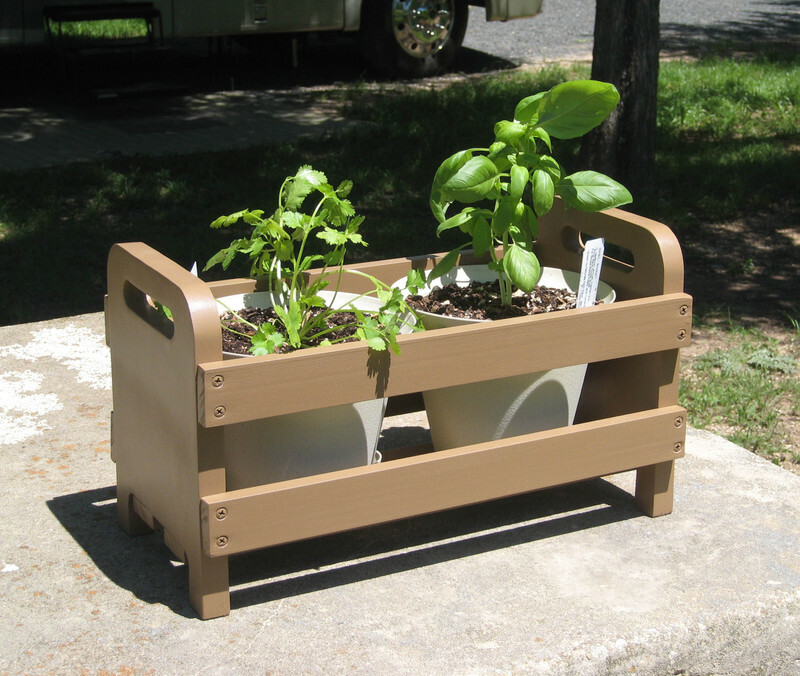 The caddy will help keep the plants upright during travel and will make moving them outside easier. In spite of not having a table saw, drill press, and belt sander, he was able to turn out a respectable-looking caddy using hand tools. Near Kerrville is the Thousand Hills Cowboy Church. We had the privilege of worshiping there one Sunday during our stay. This was a truly unique worship experience with the service taking place in a corner of their partially-completed horse arena, complete with "horsey" smells. The ministry reaches out to cowboys, ranchers, and country people with their no-nonsense message and old-time country/western gospel songs. At the beginning of the service there was an announcement for the benefit of newcomers. We were told not to touch the electric fence that surrounds the property as "it is hot and will definitely give you a perm." I was only one of two men there without a hat, and Margery was only one of two women not wearing jeans. The pastor's red heeler dog sat on the platform with him as he preached and recited cowboy poetry. It was definitely a non-traditional service, but the message was right on, and we felt surprisingly at home. One of the other things we did during our stay at Kerrville-Schreiner was some broad planning for the next several weeks of travel. After leaving the snowbird areas, we are noticing that campgrounds are getting busier on the weekends as the weather warms. 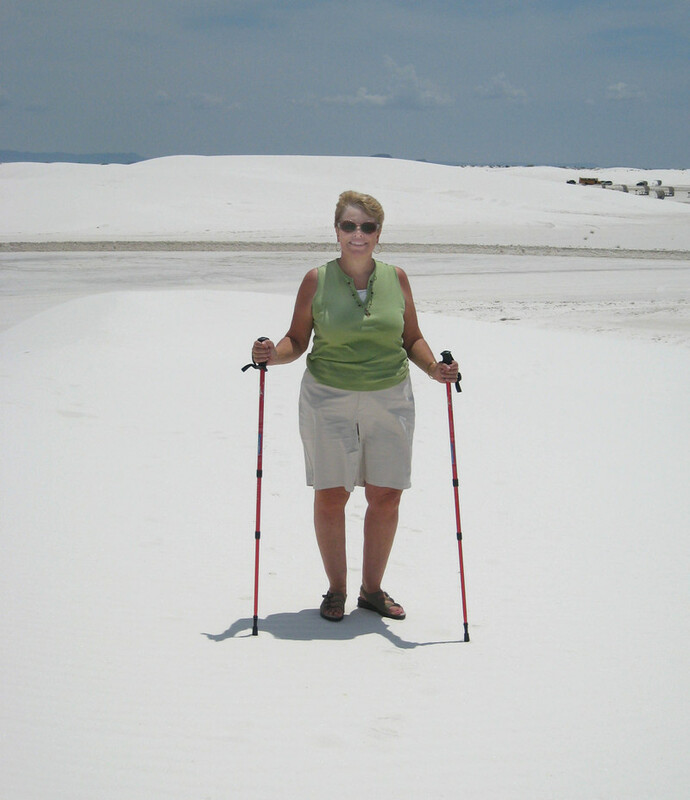 One of the great things about being retired and being full-timers is being able to be flexible in our travel plans. However, we don't want to get caught short with no place to stay, so we are finding that some planning and making some reservations are necessary. As they stand now, our plans are to backtrack through the Davis Mountain area of Texas and then head toward New Mexico. 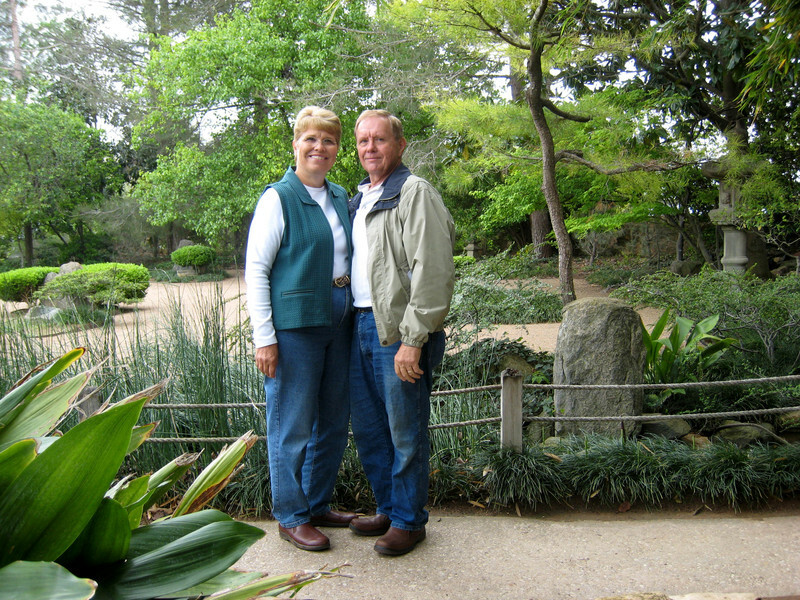 We arrived in Mission, TX, on March 1 for our month-long stay at Bentsen Palm Village. We made reservations to stay a month sight unseen because their website provided excellent pictures of their sites, and we weren't disappointed. The RV park is well layed out with full hook-ups (including cable and Wi-Fi), ample space between sites, paved parking pads and patios, and nice landscaping. Mission, TX is in the Rio Grande Valley, which is at the lower end of the Rio Grande River in the southern tip of Texas. The area referred to as "the Valley" runs from about Rio Grande City through Brownsville and on to the Gulf of Mexico. The area is not really a valley, but a delta formed by the Rio Grande River. Spring had arrived in the Rio Grande Valley shortly before we did. Temperatures were in the 70's, eventually rising to the upper 80's by month's end. Another thing that we really liked was being on the far end of the Central Time Zone where it didn't get light until 7:30 in the morning (good for sleeping in!) and dark at 8 p.m. making it seem like summer! 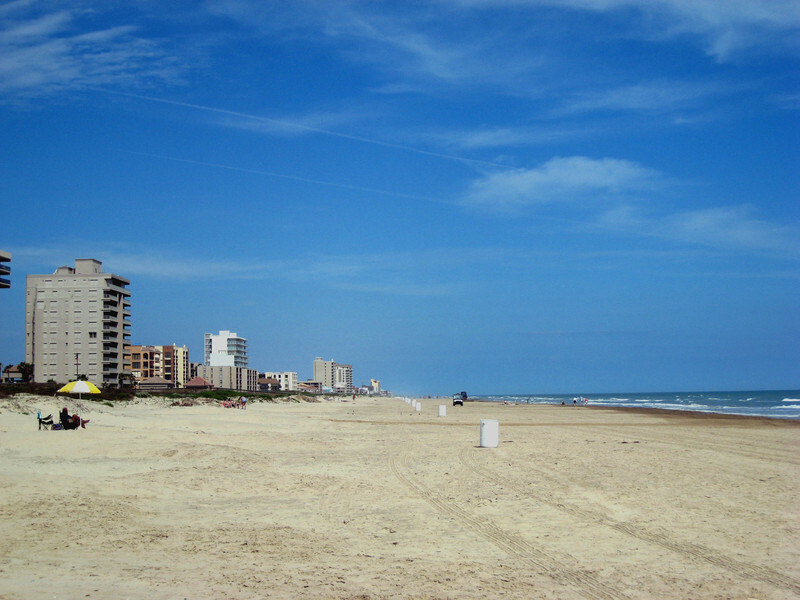 Being at the beginning of spring break and since South Padre Island is a popular destination for spring breakers, we decided to take our day trip to South Padre Island our first week before it got too crowded. We also wanted to take a dolphin tour. 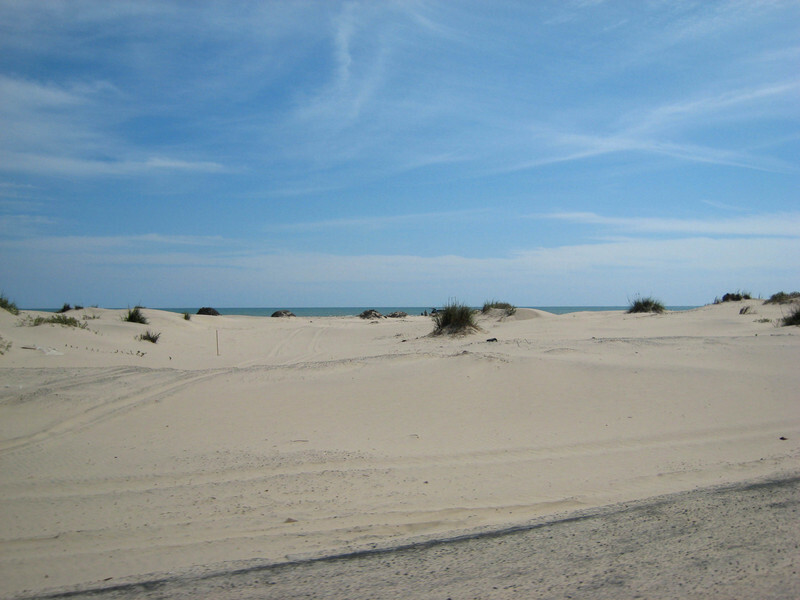 Just 1 1/2 hours from Mission, we found South Padre Island to have a comparatively small resort area with a very nice beach that was even open to cars. However, as we drove up the coast, we were surprised to see how much of the island has undeveloped beachfront property. We had made reservations for our dolphin tour with Colley's Fins to Feathers tour. Our tour guide, Scarlett Colley, has a deep love for the dolphins. Their tours of 2-6 people on a very stable pontoon boat makes for an enjoyable, educational, and up close encounter with the dolphins. 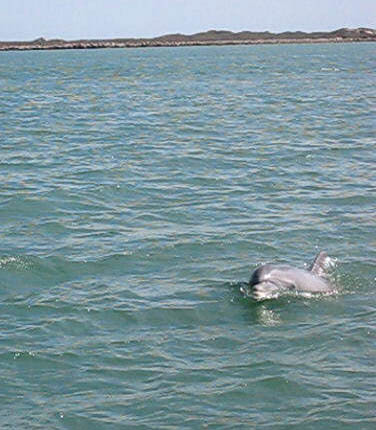 The bottle-nosed dolphin are native to the Gulf of Mexico and South Padre Island. During our cruise, Scarlett stopped several times to scoop up nets full of Sargasso Seaweed. In this seaweed live tiny shrimp, which Scarlett collected to use as food for some of her fish back at the research center. 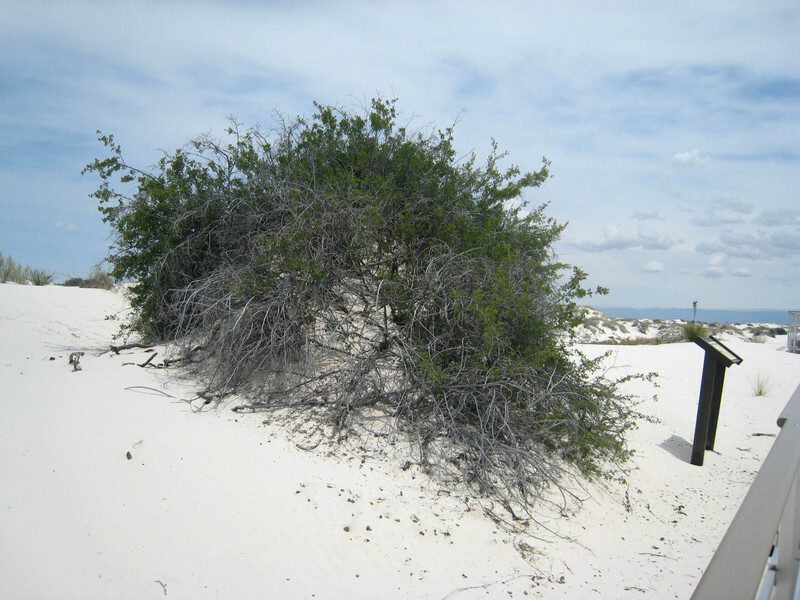 She even scooped up a Sargasso Fish which is wonderfully camouflaged to look just liPhoto Album 015: Spring in South Texaske the seaweed. See the for a picture of the Sargasso Fish. This was the longest time we have stayed in one place, and it gave us an opportunity to take care of some small projects. 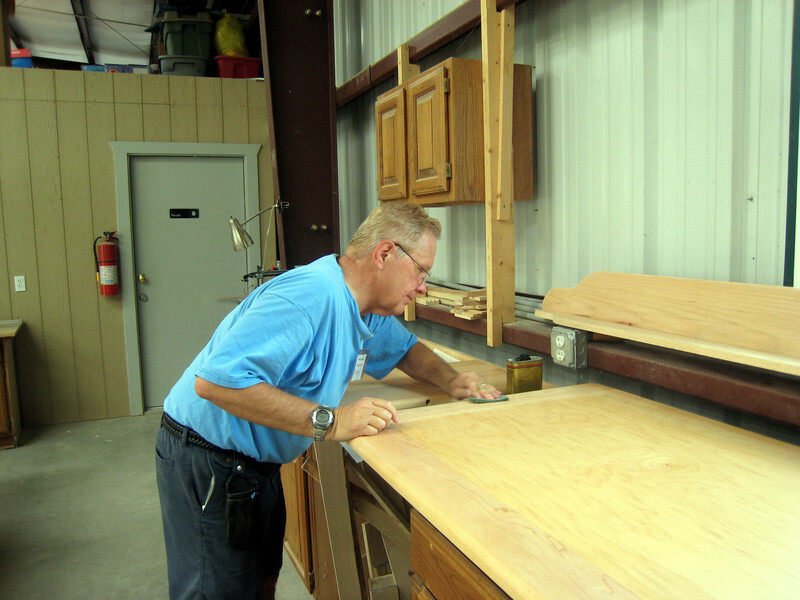 Paul used the workshop at the park to refinish a couple of the tables in the motorhome that had become water-spotted. 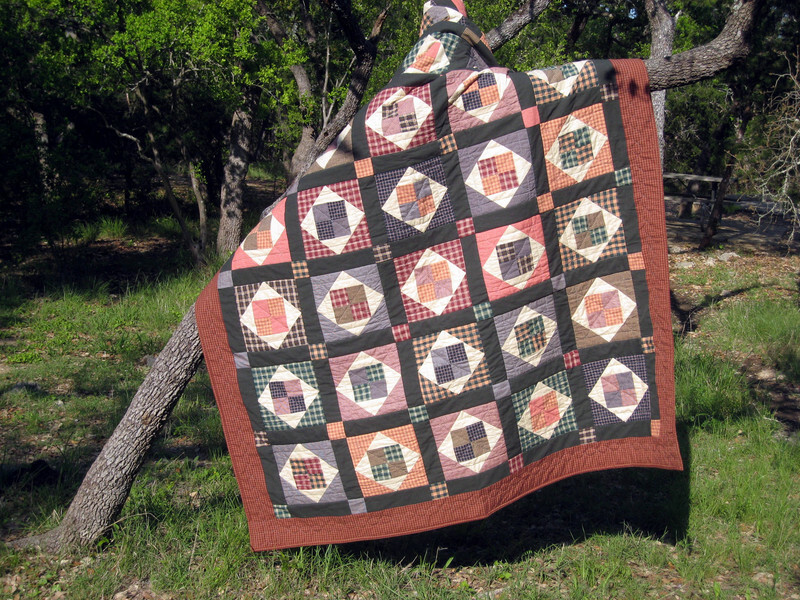 And I finished the quilt I had started over a year ago. Yippee! 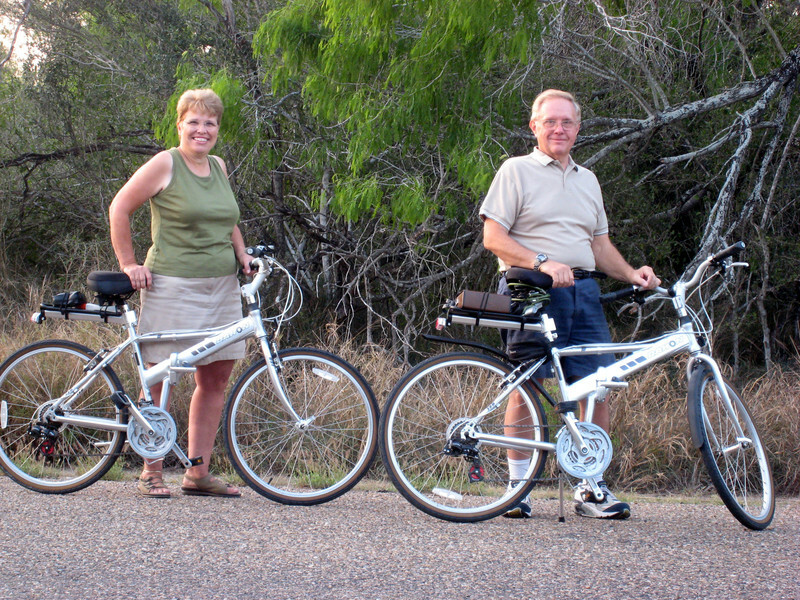 One of the great pleasures of our stay included bike riding into Bentsen-Rio Grande Valley State Park. Bentsen Palm Village was located just outside the state park which is also the World Birding Center. The state park is a crossroads of north and south bird migration, so it's easy to become a "bird nerd." Additionally, this is the only place in the world where Green Jays live. They are beautiful. 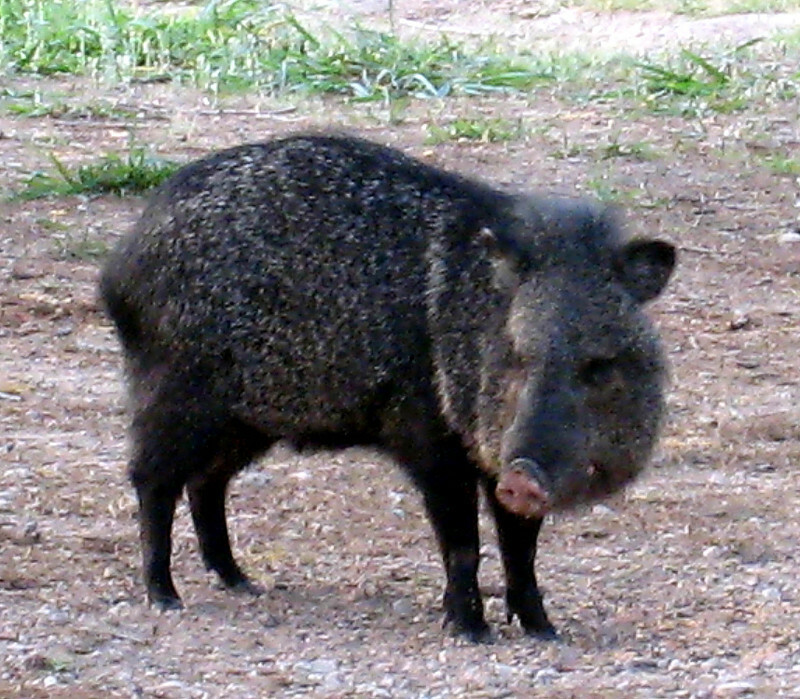 During our evening rides, we would often see javelina, (also known as the collared peccary) which, although they look like pigs, are not related but are actually from the hippopotamus family! 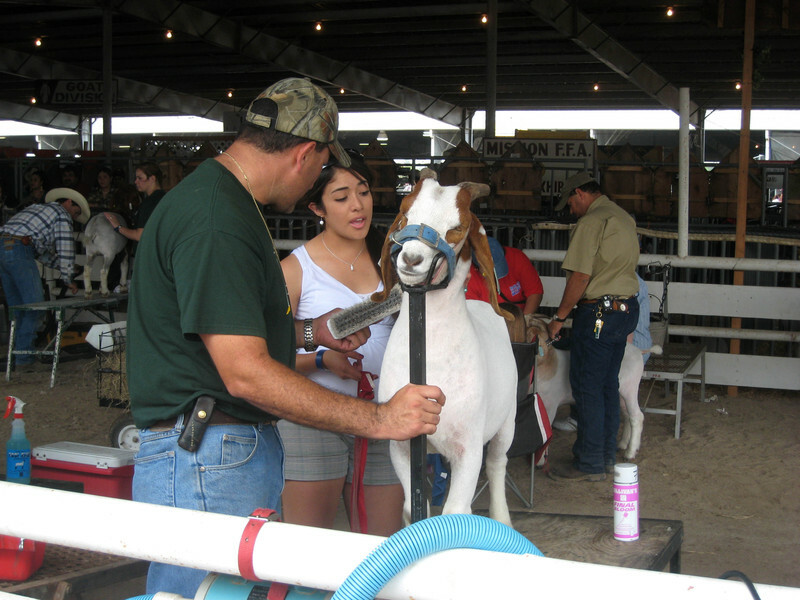 While in Mission we attended the Rio Grande Valley Livestock Show, which was much like a county fair with animals, crafts, art, flowers, etc. It was great to walk through the barns and see all the kids working so hard preparing their animals for judging. Whole families participate in the event. 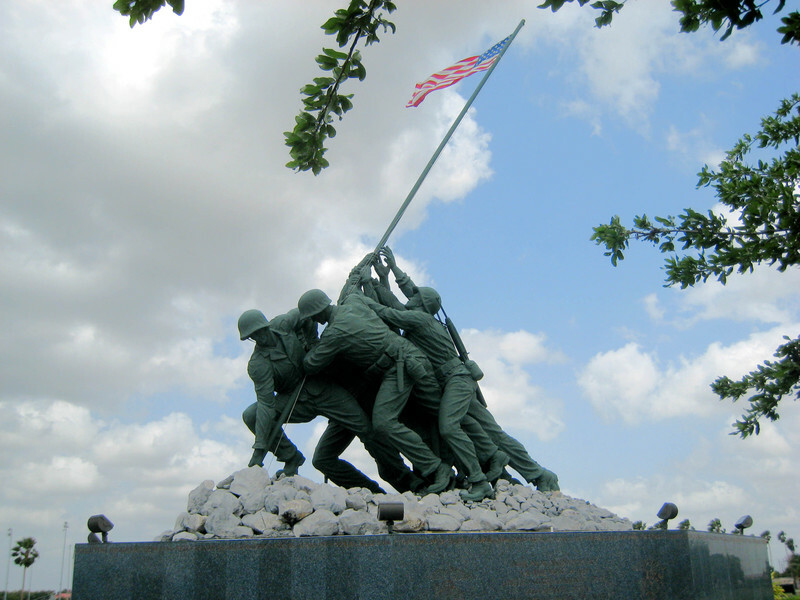 Also nearby in Harlingen, TX is the Iwo Jima Memorial. Located at the Marine Military Academy, a private college-prep school in the military tradition, the memorial is the actual gypsum plaster model used to cast the bronze memorial in Washington, D. C. The gypsum model was donated to the academy by artist Dr. Felix de Welden. Dr. de Welden was so impressed by a picture of the flag raising taken by photo journalist Joe Rosenthal he completed a scale model of the sculpture within 48 hours of seeing the photo. Over a period of 9 1/2 years Dr. de Welden increased the size of the sculpture on a grand scale. The figures are 32 feet tall and the flag pole is 78 feet long. Since the memorial is made from gypsum it must be repainted every 3 years. The relatively constant temperature and humidity in the Valley also help preserve the memorial. The Battle of Iwo Jima was a hard-fought, important victory for the U. S. Marines and Navy. During the 36 day battle, over 6,800 U. S. personnel were killed and almost 20,000 were wounded (for a total of about 1 in 3). Almost all the 22,000 Japanese on the island were killed. Because of the proximity of the area to Mexico, the influence of the Mexican culture was evident everywhere. The first time we heard an announcement in Wal-Mart in Spanish, it took us a minute to figure out why we couldn't understand it! The Border Patrol presence was everywhere and border patrol stops are routine at designated posts along major highways. There were also several other things that were noticeable. First, dance halls are popular with these fun-loving people. Secondly, we saw many very attractive adult day care centers. Finally, the majority of houses whether in the city neighborhoods or the ranches or small homes in the wide open space, are gated, which means they have fences (mostly wire) around their property with closed gates across the driveway. As we evaluate this winter's experiences in Florida, Arizona, and Texas, we're thinking we'll probably spend most of the winter in Florida next year. Although we liked Yuma, we couldn't find a park that would take reservations for just 2 months. Although we really liked Bentsen Palm Village, the wind which we had heard about, really annoyed Paul particularly. For over half the month, the winds gusted to 25-30 mph. This limited our use of the patio although we got some good resistance training when we were biking, and aggravated Paul's allergies. 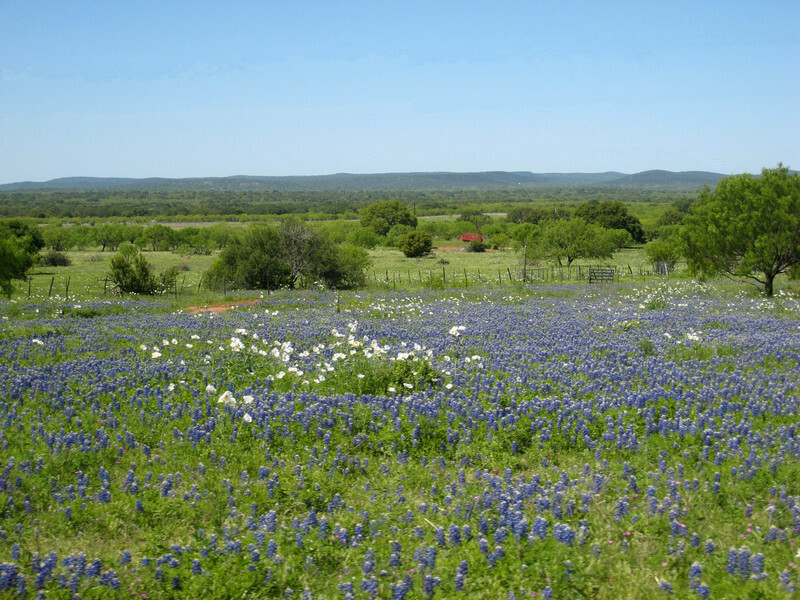 We're heading up to the Texas HIll Country to catch spring there and all the beautiful wild flowers we've heard about before heading west through New Mexico. There are additional pictures in Photo Album 015: Spring in South Texas including some of our discoveries while spending time in the bird blind, some of the beautiful landscape plants at the RV park, and additional photos of the livestock show.